New pool record for Badger women in 400 medley relay with 3:37.30. Eclipses 2010 mark of 3:40.96. Pool record number two falls here at the Nat with a 3:10.56 erasing the men's 400 medley relay mark set by Indiana in 2015. Records falling like confetti after freshman Kevin Pomeroy demolishes the Nat mark in the 3m diving! Senior Ashley Peterson wins women's 3-meter diving. We are continuing to have technical difficulties with the live stream. Please bear with us. Badgers sweep the 1000 free with victories by both Abby Jagdfeld and Matt Hutchins. Your No. 18 Badgers are almost set to go in East Lansing. Puck drop is in about 15 minutes. 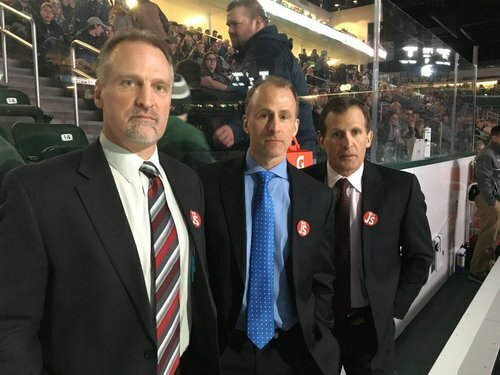 The Spartans will honor former Wisconsin coach Jeff Sauer with a moment of silence prior to tonight's game. But before puck drop, check out Andy Baggot's story on Jeff Sauer. A great read remembering the great coach. It's a full on Badger sweep through the 100 breaststroke at the Nat, with 6 pool and one school record broken so far. 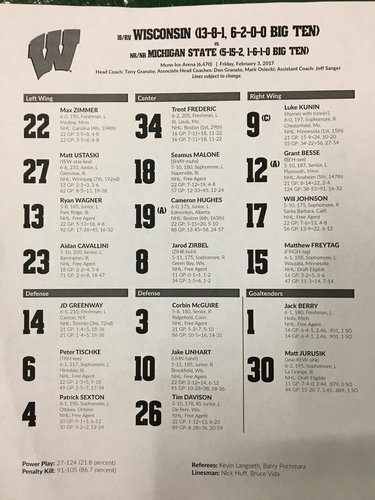 Jack Berry in net for the Badgers tonight, with Matt Jurusik expected to play Saturday. Ed Minney for the Spartans. Really cool moment happening right now: freshman Niko Stines exhibitioned 50 free alone and both teams got behind him loudly. The Spartans & Badgers are underway at Munn! 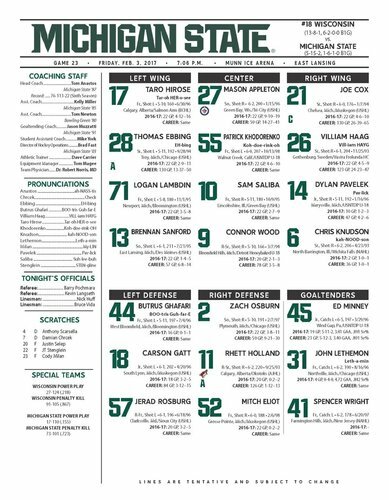 We are underway at Munn Ice Arena! 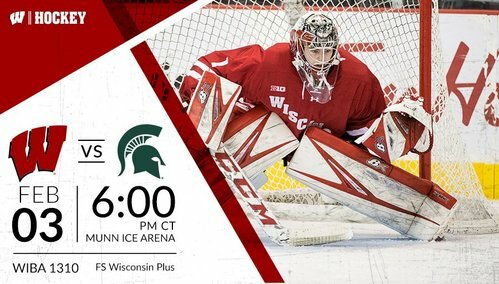 The 13-8-2 Badgers take on the 5-15-2 Spartans of Michigan State! Nice moment of silence for Jeff Sauer before the Wisconsin-Michigan State game. I hate tearing up in the press box. #Badgers have a 5-0 shots on goal advantage in the first five minutes of the game. Scoreless. BADGERS GOAL: Trent Frederic snaps a shot past Minney from the slot for a 1-0 Badgers lead in the first. 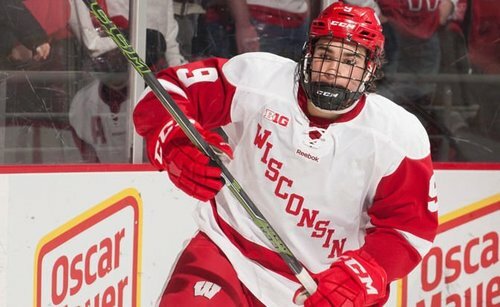 Wisconsin takes a 1-0 lead with 14:32 to play in the 1st. UW's Malone is being credited with the primary assist on Frederic's goal, but I think it was Linhart that fed him the puck. 10, not 18. 2-0 Badgers with 11:15 to play in the 1st. BADGERS GOAL: Luke Kunin makes it 2-0 after getting behind the defense. 16th of the season for the @mnwild first-rounder. Seamus Malone takes a penalty with 10:41 to go in the first. UW sends their PK unit out for the first time tonight.